A Defined Benefit (DB) plan is an IRS-approved qualified retirement plan that allows small business owners and self-employed professionals to make large annual tax-deductible contributions that can save them tens of thousands of dollars in taxes each year. Over the life of a Defined Benefit plan, a plan owner can potentially cut hundreds of thousands of dollars in taxes while rapidly and tax-efficiently building a multi-million dollar nest egg. The chart illustrates how a 50-year-old self-employed consultant earning $350,000 per year could potentially cut his taxes almost $50,000 per year with a Defined Benefit plan or over $75,000 per year by combining a Defined Benefit plan with a 401(k). In both cases, he is also saving almost $200,000 or more for retirement. Defined Benefit plans allow the largest tax-deductible contributions among qualified retirement plans. Contributions vary based on a variety of factors, including owner's age and income, but they can be as high as $100,000 per year or more. Professionals in the right situation can combine a DB plan with a 401(k), making even larger, tax-deductible contributions, and further boosting retirement savings. In this example, a 50-year old self-employed consultant making $350,000 per year could invest three to almost four times as much in a DB plan or a DB Plan with a 401(k) than he could with his 401(k) alone. 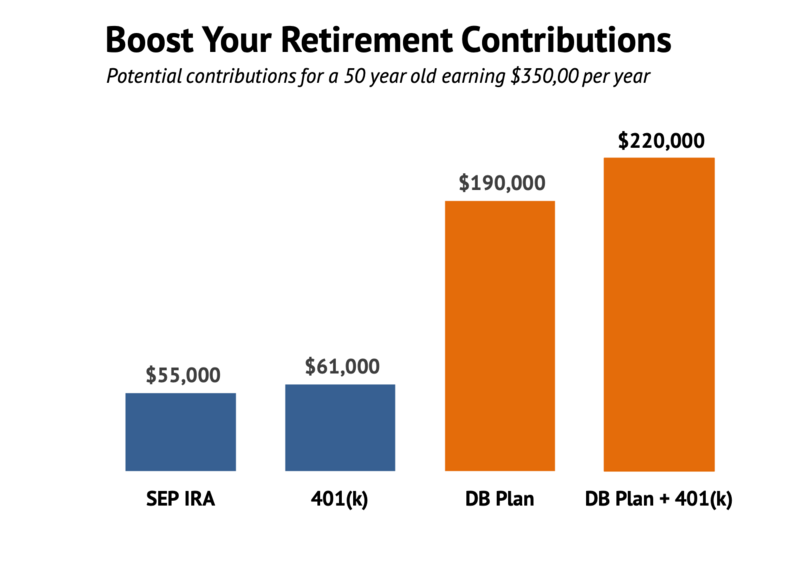 The high contribution levels of DB plans allow plan owners access to larger tax deductions than possible with SEP-IRAs or 401(k)s. These deductions can add up to big tax savings - $40,000 or more every year. In this example a 50-year old self-employed consultant with an annual income of $350,000 can potentially cut his tax bill by $60,000 or over $70,000 in a single year by forming a Defined Benefit plan. The assets you contribute to a DB plan grow tax-deferred. This growth, combined with the higher contribution limits for DB plans, allow you to build a large retirement fund more quickly than you could with other retirement plans. If the same self-employed consultant puts $190,000 in a Defined Benefit plan every year for ten years, his retirement savings could potentially grow to over $1.7M in 10 years. We work with you to develop an investment strategy suitable for your circumstances. Tax-free rollover to an IRA at retirement (or at plan termination). For successful professionals or partnerships and profitable small businesses with 10 or fewer employees, a specific type of DB plan provides an excellent tax savings tool. The following example illustrates a small medical practice with one owner, Dr. Andrews (the physician), and 3 employees. Dr. Andrews makes $325,000 per year and his employees make between $35,000 and $45,000 per year. Dr. Andrews would like to offer his employees a retirement savings plan as an incentive, and he would also like to reduce his tax bill while building a large retirement account quickly so he can retire in 10 years. He opens a Cash Balance plan with a Safe Harbor 401(k)/Profit Sharing plan. He decides he can contribute a total of $195,000 for himself - $170,000 to his Cash Balance plan and $25,000 to the 401(k)/profit sharing plan. For his employees, he contributes almost $10,000 total divided between the Cash Balance plan and the 401(k)/profit sharing plan. With this combination he cuts his taxes by over $68,000 per year and the value of his retirement plans could reach $2.6M in 10 years. Why Haven't I Heard of Defined Benefit Plans? Defined Benefit plans have been around for decades, but in years past they have typically been used by large corporations to fund employee retirement plans. A company would contribute a certain amount each year to a plan during an employee's working years to build up the plan to a point that it would be able to pay a set (defined) benefit to that employee during each year of his/her retirement. In recent years, DB plans have begun to be used more and more by high-income professionals and small business owners as a powerful tax and retirement savings tool. With our process, a plan owner is essentially both the company (that funds the Defined Benefit plan with tax-deductible contributions) and the ultimate owner and beneficiary of the plan assets in retirement. DB plans are legal and IRS-approved vehicles, but not many professionals meet the qualifications to use them, therefore not many taxpayers or CPAs are familiar with the details of implementing them. If you are an independent professional or a small business owner with 10 or fewer employees earning over $100,000 per year, you may be able to take advantage of the benefits of DB plans. To find out if you qualify, check out our page: Is a Defined Benefit Plan Right For You? Ready to join other high-income professionals and see how much you can save? Read more to find out if you qualify to take advantage of a DB Plan? Is a DB Plan Right For Me?